The luxurious adults-only resort offers a one-of-a-kind experience with anticipatory service, elegantly styled rooms and exceptional amenities. Stay connected with resort-wide Wi-Fi, in-room Bluetooth speakers, USB charging stations and free calls to North America. A variety of gourmet restaurants showcase world-class dining options catering to every taste. Activities abound, including water sports, fitness programs, yoga on the beach, mixology classes and nightly entertainment. 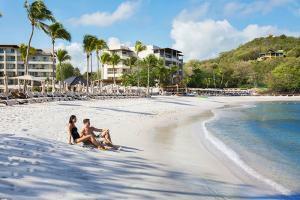 Located beachfront in beautiful Saint Lucia.